Two tailed ‘house lizard’ gave me a surprise that evening, almost making me amazed. The small reptile more commonly a house lizard is no new species to me but in all my years I have not come across anything that I saw at my home at Shantinagar on the evening of August 12, 2018. 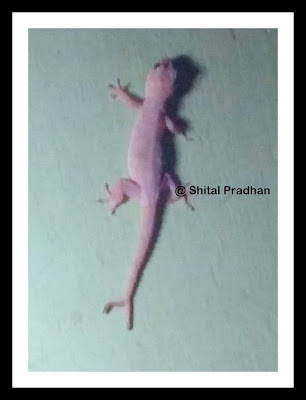 A whitish lizard, a bhitti was moving on the wall next to the dining table. At first glance, I considered it to be just the usual lizard until I saw something strange at its tail. I stood up and went near the wall to have a closer look - just to find that the lizard I was watching had two tails instead of a normal one tail. I took no time to pick up my mobile and took few shots. Shedding off a tail is a common thing, every internet articles on the tails of lizard writes. But in some cases, the new tail regenerates along with a new tail from the broken tail. Thus making a twin tail or sometimes even three tail are not uncommon. I even found an article published Singapore Post in 1960 that writes the two tail lizard brings good luck. Gangtok, 26.08.2018: Special General Meeting (SGM) was called by Sikkim Cricket Association (SCA) a day before the trials. The meeting was attended by Office Bearers, Support Staffs, Players and Stakeholders of the association. Among other agendas of the meeting, the key highlight was to inform that SCA has been recognized as one of the “Full Member” of the Board of Control for Cricket in India (BCCI) among 34 other full members. As a full member, SCA will have a voting right and is also eligible for all the other benefits. During the meeting, Sonam Pladen Bhutia (General Secretary) gave an overview of the current working of the association and the details of the upcoming tournaments that Sikkim will be playing in different categories. He also informed that BCCI will soon be releasing funds for constructing a cricket pitch and improvement of Mining Cricket Ground. Lodha Commission has been accepted in TOTO during the SGM, said Mr. Bhutia. It was also decided that General Membership will be opened for one and all after the guidelines been drafted by K. C. Sharma, Vinod Gupta, Mukesh Agarwal, Chewang Lama, Nayan Tshering Bhutia and Rinzing Bhutia. The 5 Adhoc Members of SCA has also been made full voting right members in the meeting. Lobzang G. Tenzing, President of SCA during his speech congratulated all the stakeholders of SCA for being the full member of BCCI. It is all the hard work and dedication of Northeast Cricket Development Committee (NECDC), that today we have been given the privilege of a Voting right member, he added. He also suggested that 2 members each from all four districts bodies, players association, support staffs, and women’s’ unit should be given voting rights in SCA. He informed that old constitution of SCA will be redrafted and submitted to State Law Department for registration before 22nd of September 2018. He offered best wishes to the players for the upcoming trials and cricket season. The Sikkim Cricket Players Association felicitated the President of SCA for his tireless efforts and contribution towards cricket in Sikkim. The meeting was concluded with a vote of thanks to all stakeholders by Rinzing Namgyal Bhutia, Joint Secretary of SCA. So, with excitement we have the announcements of the judges for the prestigious Temi Tea MR. Sikkim 2018 Manhunt. There are around 200 aspiring models giving tough challenges to their counterpart to be the best and get the mega title of Mr. Sikkim. Its a good news for the state that within short perion of time, we had received a huge morale boasting result. So, guys the stage is all set at Hotel Denzong Shangrila, Gangtok on August 25 and 26. The Temi Tea Mr. Sikkim 2018 Manhunt has a proud association with GBT Entertainment, The Accelerator and Sikkim Chronicle. HERE, we are…meet the judges !! Karishma Pradhan, a model and winner of Sananda Miss Tilotama 2007. She is one of the top 5 finalist Miss Pune 2006. She was the brand ambassador of RENE, a popular brand in Kolkata. The brand promoted and named their diwali collection as ‘Karishma Collection’. She was also featured in a video ‘Angel’ by Girish and the Chronicles which was aired in VH1, MTV. She is an entrepreneur and engaged in hospitality and tourism industry. Sonam Barphungpa, an actor and model from Sikkim. Winnee of winner of Mr. Vibes 2015-16 Sikkim, the first runner up of Mega Mr. Northeast 2013 and also the winner of subtitle ‘Best Personality. He made his nepali film debut with Dilip Raimazhi in Kahi Katai. Barphungpa is a brand ambassador of Hill Bike, Sikkim and Pasal, Sikkim. He looks forward to launch a clothing brand ‘Meraki’ with Mac Donald Dhungel. Rinzing C Bhutia, a fashion designer from Sikkim. She started with Genet fashion show at Kamani auditorium Delhi in 2009 with Miss India 2008 as the showstopper. In, 2012 to 2018 she represented Sikkim in many fashion events like Northeast Fashion Week, Northeast Fashion Fest, Celebrating Northeast. She too has exhibited her collection in Singapore. She organises a fashion show, designed costume for the girl band Genesis of Pink, judges fashion shows. Nirmal Mangar, a popular face in the Sikkim media. He is the Editor-in-chief of Sikkim Chronicle. In a career spanning almost seventeen years he has worked with Nayuma TV, Sikkim Express, The Telegraph. He has been conferred with State Award, Lagansheel Patrakar Award, Ram Patro Memorial Award for promising journalist and many more. Tenzing Dadul Bhutia, an entrepreneur from Tinkitam, South Sikkim. He along with his friends Girmee Sherpa and Bikash Rai founded GBT Entertainment in 2017. ‘Imperial Talkies’, the first movie theatre in Namchi. is one of the successful ventures of GBT Entertainment. The trio had also initiated a venture ‘GBT Recycle’ in the year 2014 which basically dealt with recycling of waste and unused products. Dadul’s dream project ‘ Medicinal Retreat’ will be inaugurated soon at Tinkitam. GBT Entertainment is the prime organiser of Temi Tea Mr. Sikkim 2018 Manhunt. Pragya Parameeta Satpathy Gurung, Founder and Creative Head of The Accelerator. She completed her law from Bangalore and later worked in High Court and Supreme Court. She also worked as a legal advisor for Sikkim University in 2010. She along with her husband Bhupendra Gurung started “The Accelerator”, a NE career guide magazine in the year 2013.